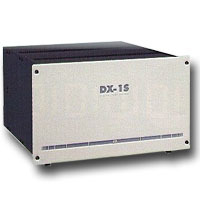 DX1S Series Digital PABX System is an award-winning digital switching system with flexible capacity expandable from 16 ports up to 480 ports. High integration and advanced technology reduce the size, increase reliability and include so many powerful feature to the system. DX1S Digital PABX System provide effective and efficient communication to the commercial environment, such as offices, hotel/motel, banks government departments, schools, hospitals and factories, etc. Already 100,000 lines had been installed in world-wide countries since 1994. The list does not include all the features. Please refer to the Users Manual for updated information. Some features may require additional hardware and software. Please refer to the Users Manual for updated information.